Freedom is one of the many great benefits of Tiny House Living and living in a Tiny House Community. One such freedom is the freedom to live off grid and have your own sources for power, water, heat, etc. A typical power setup might include a wind generating turbine, a hydroelectric setup or a solar panel array. Of course, living in a Tiny House your need for power and electricity is greatly reduced (less rooms to light, appliances or devices to power in standby mode, etc) and much more efficiently used (aka smarter) and therefore your power generation requirement is less. However, when the sun’s not shining or the wind’s not blowing, etc, your ability to generate power is limited or removed altogether. Typically this problem is solved with a battery backup system which is charged by the sun, wind or water power generation and then in the evening you run off batteries. Needless to say, this is a very exciting development. Tesla Motors is the same electric car company out of California that has produced the Tesla S which is a fully electric vehicle that some compare to gas-fuled supercars for its style, performance from 0-60 mph, etc PLUS it can go upwards of 300 miles without needing to be recharged (Tesla X the all-wheel-drive SUV version coming soon…). 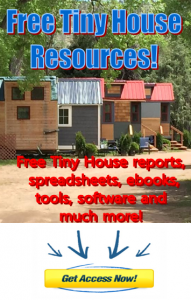 Exciting developments for the Tiny House Community and off-grid living for sure! Learn more about Tiny Houses and the Tiny House Community we’re creating with the New American Dream Project here.